Science, by the knowledge it acquires through research, allows the ever faster development of technical progress. To achieve this, researchers like those responsible for work scheduling rely on bases de reductionism which for a long time has made science successful. Meanwhile, complexity and interdependence are likely to be at the origin of risks not perceived by society, and even less by those at their origin. The object of this essay is to show that it is urgent for scientists involved in the research in engineering sciences to be concerned about the future of the artefacts they create or allow to be created. To “humbly” achieve this objective, the principle of “Socially Responsible Research” (SRR) is proposed. Our culture dictates that we win: on the battlefield as well as in frantic economic or scientific competition… today reaching the extreme limits of performance, martial violence and the economy; are we now so sure that we must always win, and this includes the domains of the spirit? (Serres, 1991). Following Wikipedia, Techno-ethics (2012a) is “an interdisciplinary research area concerned with all moral and ethical aspects of technology in society. It draws on theories and methods from multiple knowledge domains to provide insights on ethical dimensions of technological systems and practices for advancing a technological society. 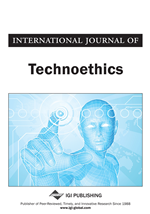 Techno-ethics views technology and ethics as socially embedded enterprises and focuses on discovering the ethical use of technology, protecting against the misuse of technology, and devising common principles to guide new advances in technological development and application to benefit society” (see also, Luppicini, 2008, 2010). Scientists involved in engineering sciences development are often more concerned by technical innovation (mono-disciplinary approach) than to a more open research including ethical and risks considerations. But, at least, according to crises and heavy trends (climate change, energy mastering, control of citizen, etc. ), the lost of trust on the usefulness on the humanistic virtues of the [engineering] sciences by the social body require for researchers to voluntary go outside their ivory towers, in order to develop a more socially responsible vision, which is presented in this paper. Knowledge for action is linked to technicality, and by the same token to the engineering sciences which have direct links with humans and their environment (Gagnepain & André, 1996). In this context, there is agreement on the fact that the “technological sciences”, the suffix logo introducing rationality, are by their nature transformers and creators of “artificial” systems. Thus, a concrete technical object is a system in which interdependencies are exercised according to numerous laws of science. However, without it being easily perceptible, artifacts act on the practices and on the culture of society as a whole (Thuillier, 1980). As a matter of fact, it would appear that our know-how is increasingly exceeding the knowledge of humans, perturbed by the very rapid dynamic of the changes taking place. Sigmund Freud, in 1908, introduced the elements now known as the three frustrations (of Freud): the first is linked to Galileo, who shifted the centre of the world; next comes Darwin, who placed the monkey as the cousin of humans, and finally, Freud himself, by situating human behaviour in a new context. Should a fourth frustration, assigned to the researcher and linked to the questioning of the primacy of Science, be introduced into these losses of egocentricity? The intention of the present reflection is to show that the main role of science, which was to paint a coherent and acceptable picture of a world in which we are forced to live, is changing. Since Isaac Newton in particular, the world of intellectuals has been dominated by “natural laws” based on rational, scientific and, until recent times, essentially determinist thought. It is indeed the success of the scientific method which has succeeded in leading Society to this high technological level. But, with crisis after crisis, it is now necessary to raise the question of the place of the “arrogant intelligence” of hard Science when, for example, reserves are decreasing and when social order is being profoundly brought into question by its technological contributions, especially for a large techno-scientific French research organization (with more than 12,000 people working in).